lovely!!! And no you ar not selfish I completely understand the need for all that space, in fact I claimed (stole) the large master bedroom in our new house as my studio, our new bedroom is relegated to a back room which is tiny tiny little place. I really like your pics! I hope that you are able to take the time to see whether or not you need 2 spaces! The wall of vintagehand bags sounds dreamy,can't wait to see that! Thanks again for sharing your thoughts and photos! 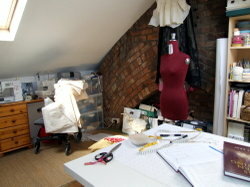 The loft looks great and I am so envious of the space. 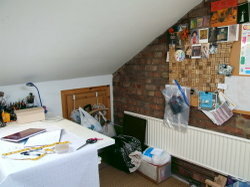 I share my craft room with the laundry! Lol! oh my...I have so much to catch up on!! looks like you have been a busy girl!! 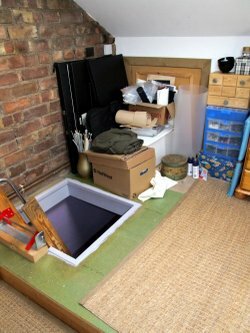 I think your studio looks wonderful! And of course you need both spaces! looks really really lovely. 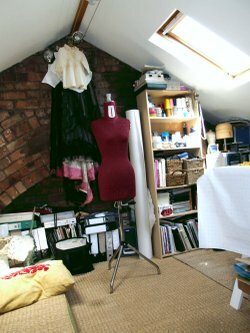 i am soooo jealous of your studio! Love the new space, there is nothing like having a peek into someone else's home! 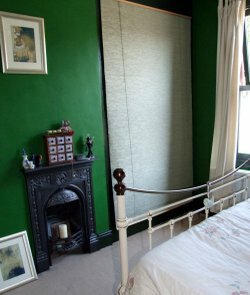 I really like the green of the bedroom (and the dear archway in your new space).